Heat your grill to high heat and let it sit about 5 minutes before cooking chicken. Mix apricot preserves, vinegar, salt, and rosemary together in a microwave safe measuring cup. Turn grill down to medium heat, and add your chicken breasts. Cook about 5 min on first side, or until chicken is cooked about 1/2 way through. Turn Chicken over on grill, and spoon/brush half the apricot mixture evenly over the chicken breasts. Continue grilling another 3-5 min or until completely cooked through. 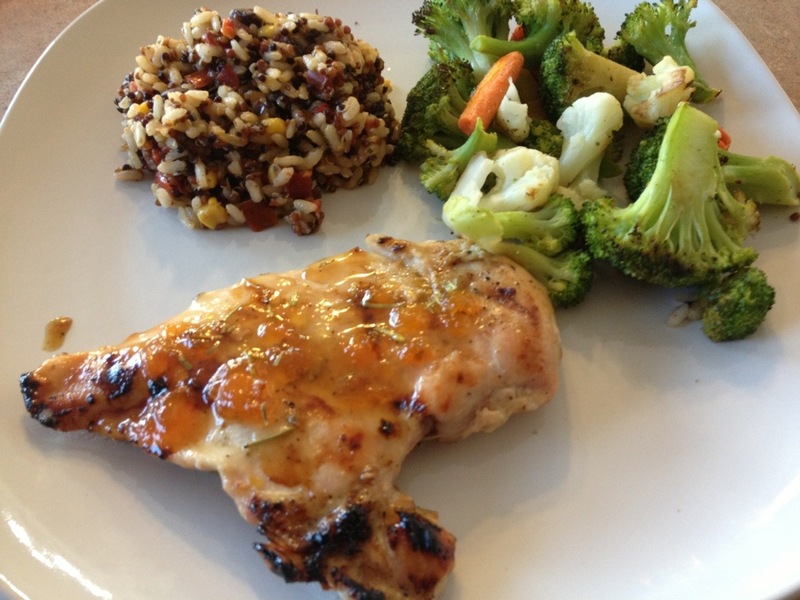 Remove chicken from grill, and distribute remaining apricot mixture evenly over the top of the chicken breasts. This is not a pretty dish, but it tastes SO good! I’ve always been intrigued and a bit weirded out by the concept of shepherds pie. I mean, why would you mix all those foods together when you could eat them nice and separately, in their own little OCD compartments??? It just seems so strange to mush everything together like that!! So, i thought to myself “self. 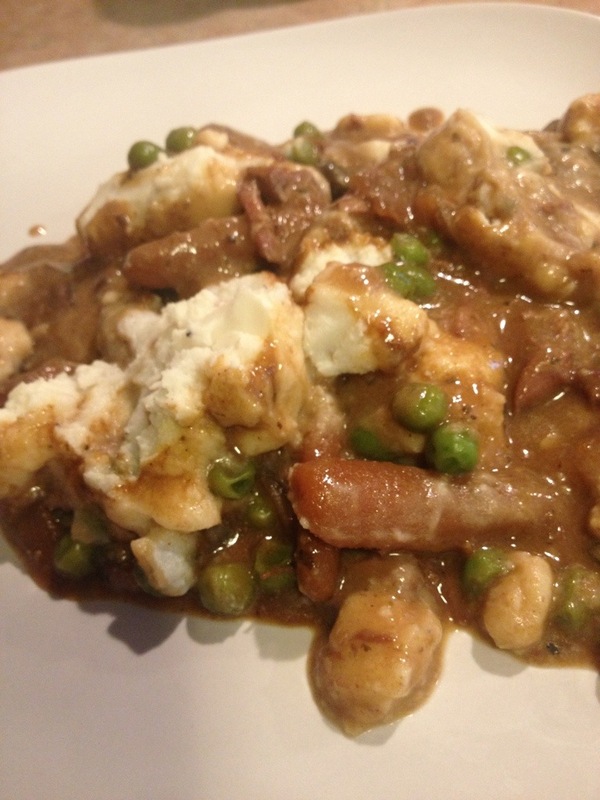 i don’t think you’ll ever be a true shepherds pie kind of girl..but you know what’s delicious together? 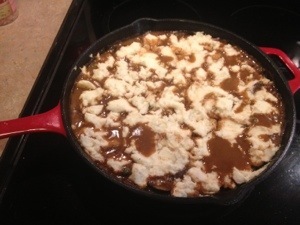 beef stew and mashed potatoes!” and so beef stew shepherds pie was born! It’s so rich, and flavorful, and hearty. This will really be great this fall and winter, and I’m so glad I made it. I hope you enjoy! PS you could make your own mashed potatoes and probably lower the calories further, but since i found these little gems, potato mashing has become a time consuming effort reserved only for Christmas, and days off. We do what we do to get the kids fed, homework done, piano, softball, girl scouts meetings, and school plays in, right? right. 1. place beef, onions, and carrots in a medium crockpot. 2. Mix 1 1/2 cups of water with beef stew seasoning mix, and pour over top of beef mixture. 3. cook on low for 5-7 hours, stirring occassionaly if you’re available to do so. 4. Once 5-7 hour time is up, transfer mixture to a large oven safe skillet (cast iron if you have one). Add frozen peas and mushrooms to mixture. 5. Remove about 1/4 cup of liquid from stew mix, and mix with corn starch in a separate container, until mixture creates a smooth slurry. 6. Add the corn starch slurry into the stew and stir well with mixture. Continue to cook on low for about 10 min, or until mixture begins to thicken. 7. 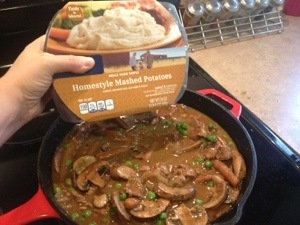 Microwave the bob evans mashed potates according to package directions. Spoon carefully and evenly over top of stew inside the skillet. 10. Place the oven-safe skillet into the Oven, and Bake at 350 for about 20 minutes.